Hey everyone, just wanted to give you guys a huge update based on what's been going on with the game regardless of the Hiatus status. It will include things that are planned as well as things that are secretly complete or in the works. Without further ado, let's get started! The Structure: For quite some time now, I had plans on making the game solely stage based with some open elements. However, while that was nice and all, it would force the game to be a little too linear if you simply hopped from world to world without anything in between. 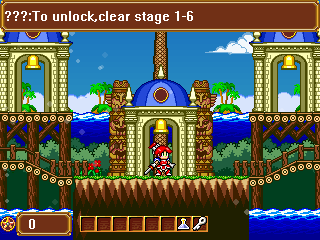 Thus, the game is now an open-world hybrid of stages and world map segments similar to games like Super Mario 64 and Sonic Adventure. I was also inspired by Zelda:BOTW's shrines. Once a certain event in the game takes place, you will be able to freely choose how you take on the game. The world is divided into several worlds across the Monster World history as well as a wealth of completely new areas. The Prototype: With the help of a new prototype engine, I was able to develop how the game's world would be structured. Before, I was upset that the teleport engine could not do what RPG Maker could do. Now the game has a complex room engine that while it is a lot of work to keep track of, it works perfectly. The prototype engine also helped me improve skills that I had lacked earlier in the year such as adding a Legend Of Zelda inspired mini map and coding that allowed me to finally be able to make more complex gimmicks such as a ferris wheel platform. Game Play/To Do List/Etc. :This is where things have gotten a bit deeper, but at times questionable. Here is a list of things that are going on that are either complete,in the works, or an idea. Although each character has their own combat style, they also need a stage gimmick that allows them to travel the world. Returning characters will play like their respective origins. 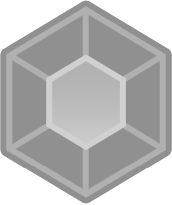 When special attacks are done,a notification will appear to warn the player of upcoming danger or their own special skills as well. Something like this would be good, but will be in a place that won't get in the way. 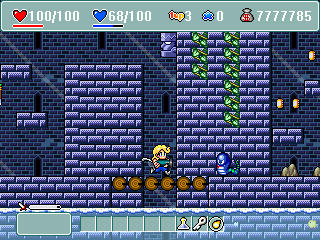 Kiki's play style now uses the power ups from Wonder Boy 3:Monster Lair, but with some new shots such as bounce and homing. Bai's play style is an all-out close range combat style similar to Zero from Mega Man X. With the help of a magic orb, she can use magic, but like most people in Monster World, she has no natural magical abilities. Ferkin is similar to Lydia, but his focus is greater on Magic. 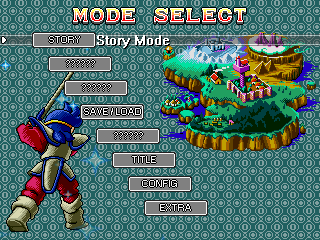 Lately, I've been playing Popful Mail(Sega CD version)to get a feel for how he should be thanks to Tatto. Lydia is the first character in MW to be a Fencer.I've been thinking about giving her a shield as it is tradition for main characters in MW to have one. Separate character HP into their own values and blend it with the Global HP. Development Point System:This is built to develop characters individually. It is not to be confused with the Skill Point System that develops the global skills that everyone can use. Skill Points however, are used for both. Knockback:Implement it. A power up will be available that gets rid of it though. Battle Zones in between stage segments. Characters say different things depending on who you are in boss and NPC encounters. Pit Riser: Rise out of pits once. It works only once per try and resets itself once you land on safe ground. There are a lot of other tasks that are kept hidden for surprise purposes and there are others that may be scrapped for future projects. Hope this brings you all out of the dark with this project. Don't let the hiatus status scare you because even if I'm not working directly on the project, there is always something being worked on for it's sake; whether it be a design document, prototype engine,sprites, or artwork. Are there any questions or concerns that you may have? If you have any feedback of any kind, be sure to post it as I have no doubt it will be helpful in one way or another. Till' next time! Hello everyone, just wanted to let you all know that the Monster World Legends project is still alive and its going through some tough times. So many things are going through some tough decision making and to be honest, I think its for the absolute best. I apologize for not releasing any updates about anything. Its been a dry year sort of for this project, and its best to keep some things a secret. Not only that, but I've done some things that a developer or person in general should never do; and that is to neglect themselves for the sake of (insert thing here). I recently read a great article about this topic and its changed how I view things. Nothing is worth your well-being. As for the project, I have some things to discuss about the changes. In previous builds, levels were built in large rooms with lots of stuff around and all, but with the feedback of several people here on RMN, levels are now less clustered and some levels will take place in several rooms. For example, you could be in a beach area for a bit, then you would enter an underwater cavern, then on the other side of the beach. Not only does this keep some levels fresh, but it does wonders for FPS. Since this game has so many characters in it, the story has potential to become big.Monster World games have always had a good chunk of story in their games, but the only characters that would talk were NPCs. For this entry, every character talks. They all have their own lives, doubts, fears,likes, and dislikes. There aren't many platform games with deep,RPG like stories out there. But, is it really necessary? I'm having issues with this point. Lately, I've realized that Game Maker is a very powerful program. With a huge encyclopedia of possible things it can do, I've been diving into learning more about how these codes and effects that could advance MWL to its fullest potential;of course this is extra fluff rather than something game-changing.I want the game to not only play good, but look good as well. Well, that's all I have for you all at the moment. The feedback I've received with MWL has been a huge help and I'm thankful to have people that are completely honest and want nothing more than to see the project be the best it can possibly be. I hope that you continue to stick with me in such troubling times. Till next time! Hello everyone, Good news. Recently, I posted a blog talking about a hard drive crash that prevented me from working on my project. I knew that after seeing the black screen of death, it was toast. However, regardless of how dark things looked, I left it on for days. All of a sudden, it boots into the recovery drive and all is saved!! Words cannot describe how happy I am right now. After losing a whole week of precious development, I am finally able to push ever forward. Thank you all who helped and supported me through this and I am happy to say its good to be back in the game:) Nothing but death itself will stop me from working on this project. We will see this through! Updated information on the game is planned this week, so stay tuned! Cheers! Hello everyone, I have some bad news. But before I get to that, i'd like to say that the development for MWL is going smoothly,however, due to a recent hard drive crash,the game is going on hiatus. I've been blessed enough for the computer to run as long as it has. However, I just...ran out of luck this time. Don't get me wrong, all the development tools for the game are on a flash drive, but all my memories and data of 2015 and 2016 and the first quarter of 2017 are gone. To be honest I don't feel all that well right now. I'm simply devastated. Until I get a new computer or it magically fixes itself somehow, I have to unwillingly place the game on hiatus. I am truly sorry. Until next time. Hello everyone, didn't want to keep you in the dark for too long. Here are a few updates that may grip your interest in what's been going on behind the scenes. Although, I won't spoil too much here. First off, I'd like to show off a slight HUD update that gets rid of those bulky hearts. This allowed more space for other important information that would also take from the bottom as well. Instead of showing if you have an Elixir, it will show exactly how much you have. Since the numbers were so big for HP and MP, your status could not correctly display if your HP was 1000 or more, it would blend into another HUD segment. That problem is fixed now. New Abilities are being added consecutively and the equipment is so heavily expanded, I had to give each equipment piece its own menu such as Weapon/Armor/Shield/Ability/and Magic.Some abilities add a strategic combat structure to your play style such as the one seen below. Lets say that Lydia runs out of MP and she is facing a monster that is weak to "Fire". If she can no longer use fireballs, equip this ability with the fire element and it will shift her sword into a fire sword. However, it will lose its attack power and atribute to become a fire sword. In some cases, its best just to use your stronger weapons over an elemental one. Characters are transforming day by day. In order to make them fun to play as, they have to look the part as well. Ferkin, Ryou, Bai, and Glaedr(Now known as Blade)are being updated on a regular basis. Here is Glaedr's transformation. He was originally made by TheRexion. It literally took FOREVER to figure out a costume for Lydia that I really liked.She went from being similar to Asha with her baggy white pants to more of a warrior-princess look. As for other areas of the game, not much is going to be said yet because the standards for stages, and story line are being updated. Many stages seen in the past are going to vanish simply because they don't fit today's standards for this project. Some of them have simply been recycled since the development of this project began. Sometimes, its just best to start over and remove anything that is otherwise bland, lifeless, or just not fun to play in or return to. For story however, that part is going to be extremely fun to make! I cannot wait until they begin to interact with each other and have reasons for joining this fight rather than just being in a game play demo for show. Bringing in 6 new characters, and gathering several from various time periods is something that is going to be exciting and challenging to develop. Heck, if certain things go well, more characters from the series' history just may appear. Well, this is as far as I'll go for now. Since this game's development is in full bloom, things can be made faster and more efficient than ever before:) I hope you'll all stand by me till the very end. Thank you! Hello everyone! As you all know, a conceptual demo of MWL was released last week demonstrating what the game has in store for its future. 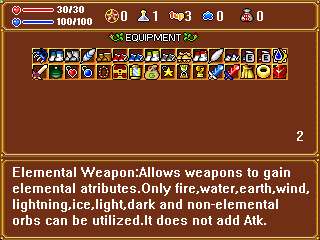 Many things were heavily limited such as the skill grid and equipment choices. In a nutshell, about a good 8% of the game was in that demo. So what is in store for the project as of now? Well, first off I'd like to say that now, the equipment system will now be branched off into their own menu segments to allow more equipment to be in the game. This means I can heavily expand on it while bringing every weapon from the franchise and even original equipment in. More game-changing abilities could be added such as something that increases the action meter speed or something of that nature. 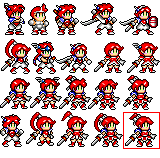 Within the game are over 1000 sprites, over 50 of them belong to particle sprites. After playing a variety of games like Kingdom Hearts, Tales Of, Soul Calibur, and Star Ocean, I noticed all of these nice bursts of special effects when you cast spells or hit enemies with attacks.In order to have this game at its max potential, learning particles is a skill that is an absolute must. Most demos thus far have all been about game play. In games like these, its wise to solidify the game play first while having a story in mind. I read an article about Final Fantasy's Tetsuya Nomura about his experience with making Kingdom Hearts 3. He says that when making those games, they make a battle system they believe would work, then make a story revolving around that said system. 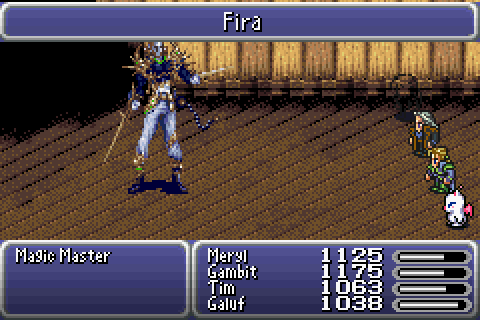 I'd say the battle system itself needs a bit more work, but things are expected to improve and change over time. The rest of the cast is being fleshed out and current cast improved on. In total, a cast of 18 party members are planned. There was an idea to play as Queen Eleanora and the Darkworld Prince from Monster World 3, but the idea was scrapped and they were changed into summons. I believe people will become more smitten with this project if a story was added with dialogue so they can learn more about the character's personalities and reasons for joining the fight for peace. Expect more talk about the official storyline down the road. In the manual of last weeks demo, it explains about types of stages in the game or will be featured in the game. Towns, Dungeons, Stages, Adventure/Overworld Maps,and more. Battle Zones are also planned in between segments that are similar to Beat-em-up type games. You will not be able to progress until all monsters are eliminated from the area. Monster World is only home to a handful of characters...with other characters...well, I'll leave that up to your imagination. 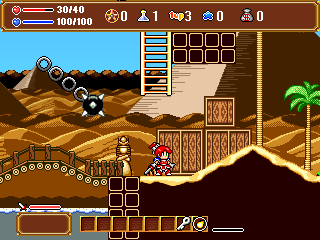 Planned in the game are an assortment of mini games that utilize the engine's sprites to the best of their capabilities. The original plan was to make a separate game similar to Wario Ware or Mario Party. However, this game would only be based on Mini Games only. From games to a short platformer, space shooter, scrambling for items, and an assortment of other ideas. How did you all feel about the last demo? 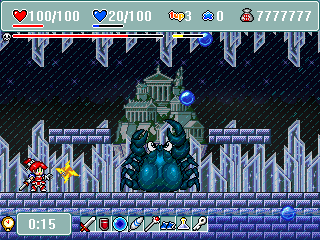 Monster World IV-2:An expansion of MWIV showing the aftermath of what happens after the first game. 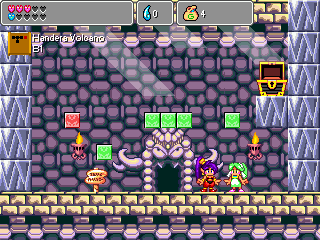 Asha&Shantae:A game that blends these two heroines together. However, I have to play more Shantae first before I do anything. Well, that's about it for setting up an atmosphere for what is in store for MWL. As for all you Wonder Boy fans out there, I'll tell you the same thing the creator; Ryuichi Nishizawa told me. "If you enjoy Wonder Boy, then I am happy".Cheers! After two days of absolutely NO SLEEP,the newest demo is out everyone! Here are a list of features that are in, that are planned, and features that were removed for certain reasons. A Manual was also added both here, and in the game package. Before playing, please take the time to read what you are about to play. I keep seeing this quote up on the RMN page that says something like..."reading the manual was like foreplay, it got you in the mood for the real thing"
A small, but powerful package that has the most variety and polish the game has ever seen before. Play through 12 demos featuring areas such as stages, adventure map samples, and even a couple of boss battles. It is highly recommended that you explore some of the stages, activate skills,equip some things, get items from Alsedo, and level up your characters first before trying to take on one of the two bosses. Reap the rewards of trophies! Here is the link to the demo! This is literally going to be me the next day or so. Hello RMN! Its that time again. An update on what to expect for the new demo and the game as a whole for the year of 2017. Today, we will be discussing several concepts on the game's design as well as giving an overall progress report. First things first, lets talk about the battle system. In recent years, the battle system had a fixed set of battle content and you could not grow whatsoever. The only growth item you could receive was a temporary HP and MP doubling item. 2016 was all about experimenting with new concepts and fleshing out the battle system to a greater degree that the Monster World franchise has ever seen.In the long run, it was a great decision because so much was learned in the process. Due to the heavy increase in advantages for the player, bosses have become a bit more challenging and strategic. Bosses now have the ability to block, heal, cast magic. However, they are vulnerable to things like being stunned or being weak to certain types of attacks. Weaknesses play a big role in killing certain bosses quickly as some of them are aggressive and won't go down without a fight. New modes are being developed actively. To celebrate the 30 year mark of the franchise, all kinds of bonus contents are being added such as adventure mode, a library to read up on characters and events of Wonder Boy/Monster World, mini games that range from shooters to small 2D adventures, and even a trophy gallery to display your in-game achievements. In the past, most(if not all) levels took place in a single room. With the heavy advancement that took place last year, the game now allows you to backtrack between rooms. This is due to levels becoming much larger and more varied. This was a necessary step in order to take the game to its maximum potential. 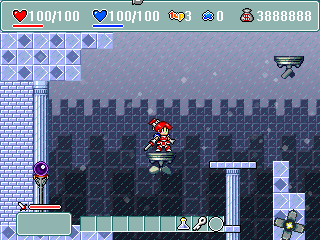 Levels can now consist of one or more rooms and may or may not allow you to backtrack. Usually, arrows will let you know if you can move between screens. In a nutshell, the stage system is a hybrid of Monster World 3 and 4. A new demo is on its way!! No, I am not kidding. A new demo is on its way soon due to a complete lack of one in 2016. I want ALL of you to get your hands on this brand new version with a complete design overhaul from the September 2015 demo that is currently holding the download button. This will be Semi-final demo 2 of 3. This may be the last demo before the the final game comes out, but for now, that's what we'll call it. Hello everyone and Happy Thanksgiving! Its a special day, so I thought I'd share some new content and a series of brief videos that go in better depth than the one released earlier in the Media Section. First order of business is the sound engine. The past couple of weeks has been strictly focused on the sound engine. MWL could not support MP3s and the sound effects were cutting off the music and had bad quality. Why? Well, because I had too many sound effects and music in the game causing it to run out of memory and cause glitches in sound. Next, there has been an update in the amount of platforms and gimmicks. There was one in the 30 minute video of the Media section, but this one is extended a bit by adding both a balance platform and piano keys. Can you guess the secret song played on the piano? In the previous video, there was an item test, but there was so much going on that you couldn't depict what was what, so here is a better in-depth video of the items. I always wanted to add this, but I found a way to make a custom day/night engine that is simply a special effect in certain areas. Here is the sample on Moonlight Castle. Over the course of development there have been some very difficult decisions on what kind of stage map to add. Should it be Mario Styled with simple blue and red buttons, or should it be a complete "walk everywhere" map. I chose the latter. What's next on the to do list?